Quesadillas go gourmet in this rich southwestern dish featuring Campbell's® Reserve Roasted Red Pepper & Smoked Gouda Bisque. flour tortilla, 10-inch	 80 oz. 32 ea. goat cheese, mild, soft, 4.5 oz logs	 27 oz. 6 ea. 1. 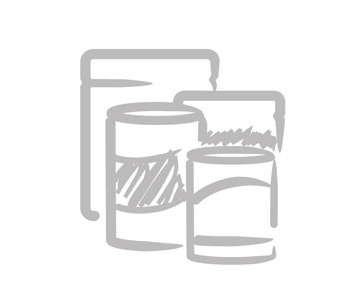 Heat Campbell's® Reserve Roasted Red Pepper & Smoked Gouda Bisque to 185°F. Hold at 165°F. 2. Place one tortilla on work surface and spread with 2-oz. of goat cheese. Spread 1-oz. of Basil Pesto over goat cheese. Spread 1-oz. Campbell's® Reserve Roasted Red Pepper & Smoked Gouda Bisque over pesto. Top with tortilla. Repeat with remaining tortillas. 3. Spread bottom of each quesadilla with ½ tablespoon of butter. 4. Heat griddle or well seasoned 10-in. cast iron skillet over medium-high heat until hot, but not smoking. Cook quesadillas until golden, approximately 4 minutes per side. 5. 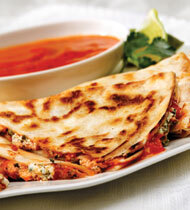 Cut each quesadilla into 8 wedges and serve with side of Campbell's® Reserve Roasted Red Pepper & Smoked Gouda Bisque. flour tortilla	 80 oz. 32 ea. goat cheese	 27 oz. 6 ea.